In New York City, I lived right next to an express train. It ran on a fairly regular basis and would get me anywhere I needed to go. If I wanted to go visit my family, I hopped on a regional Amtrak train. Compared to the other subway systems I’ve seen around the world, the New York City subway was outdated and filthy. Compared to the regional and express trains I’ve seen (Shinkansen, anyone?) Amtrak is a rickety old piece of junk. 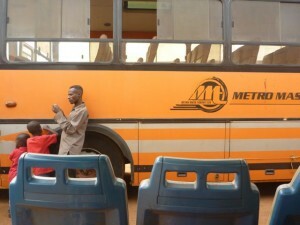 Alas, the transportation system in Ghana makes me long for my junky but convenient New York trains. 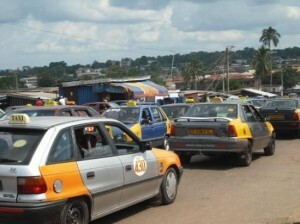 The roads in Ghana fall into three categories: paved and potholed, bumpy and dusty or “work in progress”. You are usually transversing these roads in some old vehicle that was sent over from Europe because it was no longer road worthy. When traveling, you can usually choose from a number of options depending on your budget. Taxis: In Ghana, Taxis are everywhere you look. It seems sometimes like Taxis make up 90% of the traffic on the road, and even more it seems like half of them are empty. That being said, you have two choices when it comes to taxis. In some places, you can share a ride in a taxi that runs along a common route. This will usually cost you a few cents (I can get to town from my house for about $0.30). If you are in a hurry or going someplace less common, you can get a taxi all to yourself. This is much more expensive, and it seems that the drivers will try to charge you as much as they possibly can for this kind of service. Tro-tros: When you are traveling someplace a bit farther away, your best bet is a tro-tro. A ride in this overcrowded death trap is usually pretty cheap, and they are running every time of day. The downside being the fact that you usually have some stranger sitting on your lap, and the fact that tro-tros are frequently involved in fatal accidents. On less traveled routes, a tro-tro is sometimes your only option. Along the very rural and untraveled routes, they will oftentimes fill the car to seemingly impossible capacity. Ford Vans: If you are traveling along a very common route (i.e. 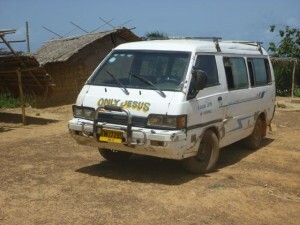 Accra to Cape Coast) you are likely find the “intercity express” vans. These vans are larger than tro-tros, take less passengers and even have air conditioning! They fill at the station and do not stop until they reach the destination, unlike tro-tros which are always stopping along the road to drop off and pick up passengers. The express vans get you to your destination much quicker, not to mention cooler. Metro Mass Transit: For longer journeys on the cheap, you can take the metro mass transit. These are similar to an old school bus. They are very cheap, but once again you are going to have someone sitting practically on your lap. Sometimes, you will stand. The bus will stop every couple of minutes for passengers, sometimes cramming them in until even the aisles are full. Again, on less common routes this will sometimes be the only option. Inter City Buses: A good but much more expensive option are the intercity buses. The state-run company STC offers seats on a spacious an air conditioned bus, supposedly running on a set schedule. Other private companies have similarly luxurious buses running on a “when it’s full” basis. These buses are much more expensive, but it’s a good idea to splurge if you are traveling long distance. Especially since what is supposed to be a “4 hour” journey in Ghana can easily spiral into an 10+ hour ordeal. I will add that vehicles meant for long-distance journeys are also usually equipped with a television. Along the way you will likely watch films movies like this at max volume.